Roads and infrastructure are in place, settling ponds are constructed and will only require minor work to be fully functional, some ventilation ducting is on site and will be used in the decline tunnel into the white channel. Some testing equipment is on site, production equipment will need to be purchased. Water is available for the mining operation. 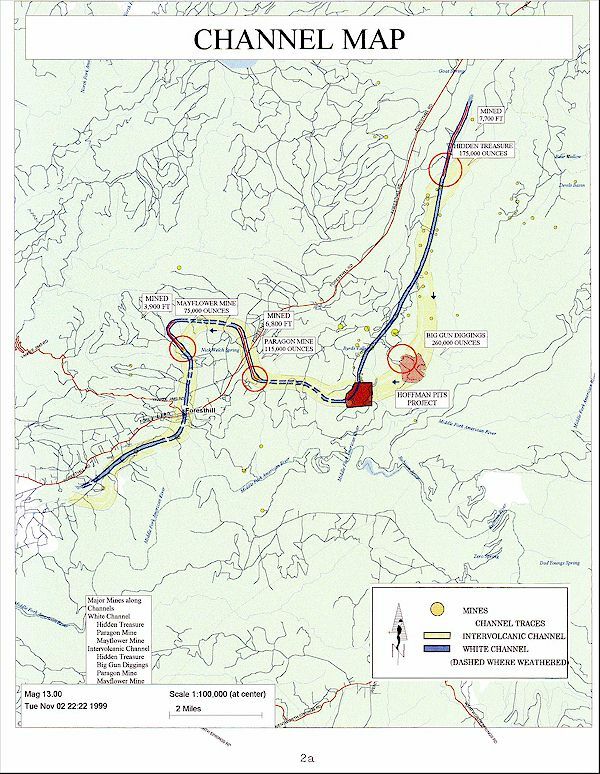 Drilling has been completed in the area adjacent to and parallel with the direction of the decline tunnel. This drilling of six holes has verified the depth to bedrock and the width of the channel as well as the type of material in the channel. Geologic mapping has been completed on the western part of the property and during the next few months we will be completing seismic work and as part of that operation detailed topographic maps will be developed allowing better bedrock profiles to be developed. 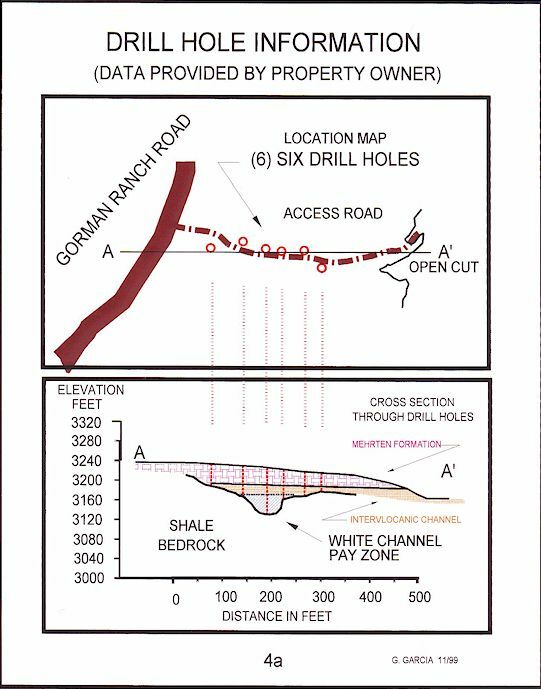 It is difficult to assess the reserves on this property as with any placer-mining property. We have every reason to believe, based on past production from the open pit on this property, that after the removal of a small amount of overburden, we will mine approximately 15 feet of gravels which will produce gold at the rate of $143 per cubic yard. We could dig deeper but the price per yard begins to drop. The initial pits contain approximately 130,000 cubic yards of material. We expect to mine 484,000 cubic yards in the first several years. There are at least ten (10) acres which we could mine. We estimate that approximately 163,000 ounces could be removed. Drift mining the White Channel should produce better than 111,000 ounces of gold. This is the underground portion of the operation. There is a bend in this ancient channel on this property and normally when a channel becomes wider it also becomes more productive. Overall this should prove to be a very productive property which can be mined on nearly a year round basis. 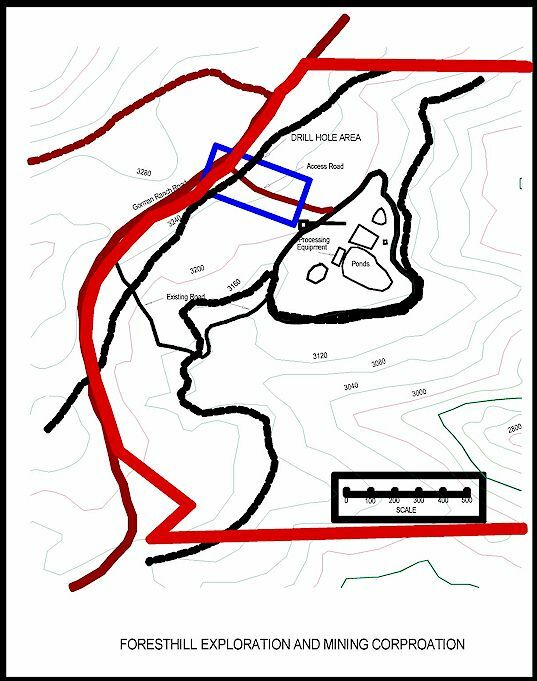 The Hoffman Pit is part of the White Channel system which coursed through the Hidden Treasure Mine, Big Gun and Bird�s Valley pits, turning westward, coursing through the mountain at the Hoffman Pit area, on its way to the Paragon and Mayflower mines. The pre-volcanic, Mid-Eocene channel has a wide course, ranging up to one-half mile wide and is known for its abundant quartz gravels. 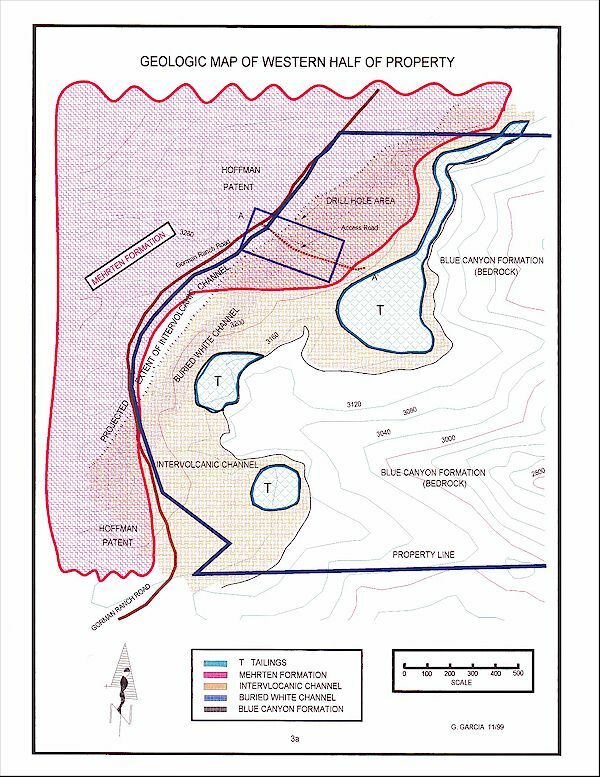 The pre-volcanic channels generally contain more gold than the inter-volcanic channels (Blue Channel), which derived most of their gold from reworking the earlier channels. The bedrock is soft slate of the Blue Canyon formation, schist and there is serpentine. The channel is capped by a rhyolite tuff or andesite mud-flow, which might be interlaced with inter-volcanic channels. The lower gravels of the Michigan Bluff Mining District are nearly pure quartz with many large boulders. Generally, during the early years of mining, over 6 Million cubic yards of material was mined, producing over 5 Million Dollars of revenue. Much of this gold was coarse and if computed at $750 per ounce gold, would yield 195 Million Dollars. Some narrow quartz-gold veins are present in the area but have not been located on this property. 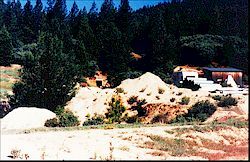 These unpatented mining claims are located in the Michigan Bluff Mining District of Placer County and cover approximately 228 acres. There is good road access to this property. The richest Old River (channel) found during the 49er gold rush was the White Channel at Michigan Bluff. 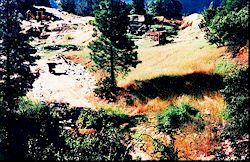 The richest underground placer mine was the Hidden Treasure Mine. California State Mineralogist C.A. Logan (1936 report), Ross J. Browne (1868) and Federal Mineralogist Waldemare Lindgren (1900, 1911) make reference to the White Channel and various mines operating there. Logan and Lindgren state �the Hidden Treasure Mine was the largest producing drift mine in the state�. This property is two miles distant. The Big Gun Hydraulic Pit is 0.5 miles distant. Logan and Lindgren report, �there is no doubt that the camp was one of the most profitable from the standpoint of Unit Yield�. Lindgren describes the Michigan Bluff mines as �exceedingly rich�. 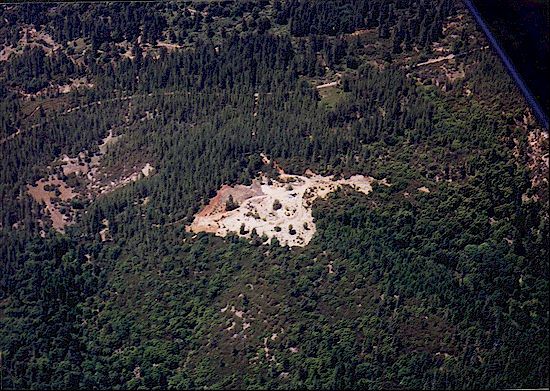 The Bird Valley Mine is 0.25 miles distant and is listed as the richest ground sluiced mine found in California. The Hidden Treasure Mine produced gold worth 131.25 Million Dollars at $750 per ounce gold and the Big Gun Mine produced over 195 Million Dollars. The left picture is a view from above the decline tunnel facing settling pond and processing equipment. The area to the right has been contoured and some reclamation work has been finished. The picture on the right shows the decline adit and stockpiled ventilation ducting and support material.